The 500 pound gorilla of the spring season arrives in theaters this week, in the form of the first film from The Hunger Games trilogy of books. Although other films ducked away from a long time ago, the hype has steadily increased over the past few weeks to the point where it would be the only game in town anyway. If you're going to a movie this weekend that's not The Hunger Games, be prepared for some cold stares. For the benefit of the seven people who aren't familiar with the series, it's a young adult novel series set in a post-apocalyptic North American dictatorship named Panem, with outlying rural regions kept under the heel of a tyrannical central government through control of the food supply. 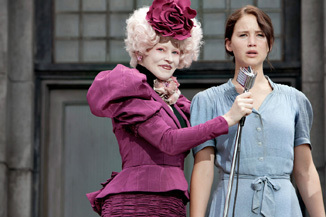 And to make sure things stay that way and to just be general bastards, there's the titular contest, a televised Battle Royale-style fight to the death among one boy and one girl from each of Panem's districts. Filled with glitz and glamor, the spectacle highlights the imperialism and decadence of the central government. A wild card is thrown into the mix when one entrant named Katniss volunteers to spare her younger sister from certain death, and proves to be so competent and scheming that she could upend the entire apple cart. Such is the stuff that young adult literary sensations are made of. The latest book series to be required reading by force of law, the first book has sold an estimated three million copies plus another million eBooks, which are ridiculous numbers in the publishing world. So it's only natural that with its big-screen friendly action premise, and with studios looking for the next big adaptation series now that Harry Potter is done and Twilight is wrapping up, that this would get a full treatment. That timing is probably proving to be its biggest asset, as it has the cultural zeitgeist all to itself at the moment. Although you could have sold this movie with just about anyone in it, the casting seems to have been done quite well, with Jennifer Lawrence playing the female lead, a stripped-down no-nonsense action chick. After she burst out of nowhere to earn an Oscar nomination for Winter's Bone, Lawrence immediately became a hot commodity, in kind of an eerie parallel to certain parts of the Hunger Games plot. But as a fresh face, Lawrence is on the cusp of breaking out as a household name – and for the somewhat unusual reason of deserving it. Journey to the Center of the Earth and The Kids Are All Right star Josh Hutcherson plays Peeta, the boy from Katniss' district who is also chosen for the games, while the rest of the cast is rounded out with a bunch of familiar names – Stanley Tucci, Woody Harrelson, Elizabeth Banks, Donald Sutherland and Wes Bentley, to name a few.